All eyes are on Congress at the start of 2019. The Richardson area has welcomed back area incumbents, and said hello to a few new ones. One particular North Texas freshman has drawn the attention of GQ magazine to document his transition. 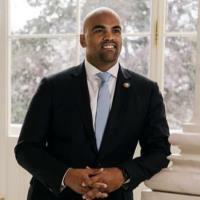 Colin Allred is one of those people whose résumé prompts parents everywhere to remind their children—no matter their children's actual ages—that they really need to get their lives together. The newly elected representative for Texas’s 32nd congressional district, which comprises parts of Dallas and its northern suburbs, Allred finished law school less than five years ago, in 2014, and then joined the election-law practice of a firm in Washington. He left in 2016, when President Obama appointed him to a position in the general counsel’s office at the U.S. Department of Housing and Urban Development. Learn more about Colin Allred in the GQ articles here and here. Read Pete Sessions’ reflections here in the Texas Tribune. Sessions' favorite memory came about a decade after the Dallas Republican came to Washington in 1997. Sessions was in the Oval Office with his son, Alex, who has Down syndrome. The bill was one Sessions had been working on for families with disabled children who made too much money to qualify for Medicaid. Sessions wanted to give those families the ability to buy into Medicaid after he received a letter from a family with a son with Down syndrome and a severe heart condition. The family's income was just above the maximum threshold to qualify for government assistance. The boy later passed away. Sessions explained to Bush the bill that his son was talking about. In 2006, Bush signed the “Family Opportunity Act” bill into law. Sessions considers it his top legislative accomplishment.